Successful Senior Marketing is designed to provide you with numerous exciting and effective ways to promote your services, make group presentations, and organize a local care planning council of professionals. Here is what you receive with the system. 1 - You will learn about strategies such as collaborative marketing, relationship marketing, group networking and Internet email campaigns to promote your services in the community and find new clients. The SSM system also includes a startup kit with step-by-step instructions on how to get started and over 11 hours of video training. 2 - You will benefit from detailed instructions for using an Educational Presentation Marketing Package included in SSM which contains a comprehensive set of 175 mix-and-match slides to put together custom educational workshops in your community. Presentations can cover 21 different aging senior issues and can be adapted for encounters of 30 minutes, 60 minutes 120 minutes or 3 hours. 3 - You will receive over 100 pages of instruction to organize a local senior planning council. The council is a group of like-minded senior service providers who contribute expert advice and provide a community one-stop shopping source for senior services. If you organize a local council, the National Care Planning Council will set up and maintain a website for your local group at no cost to you. Starting such a group is an optional endeavor for you but it will help to enhance your marketing reach. 4 - With the system, you get templates for a number of effective brochures and you have access to over 100 ghostwritten articles for advertising and Internet campaigns. You also receive list sources for finding various sponsors for your educational presentations and list sources for finding members of your local council support team. 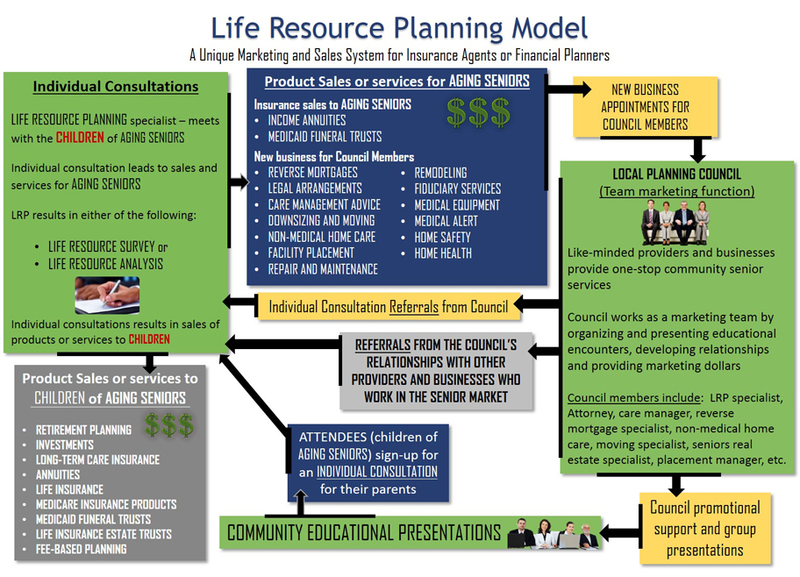 Here Is the Model of how the Life Resource Planning System and the Successful Senior Marketing System Dovetail Together.